Tujunga, CA – Competition Motorsports’s Porsche 997 GT3 Cup Car is prominently displayed in the all new Porsche section of Motegi Racing’s motorsport brochure. Bob Faieta’s Porsche 997 GT3 Cup Car displays Motegi Racing’s iconic MR630 Technomesh Motorsport racing wheel. 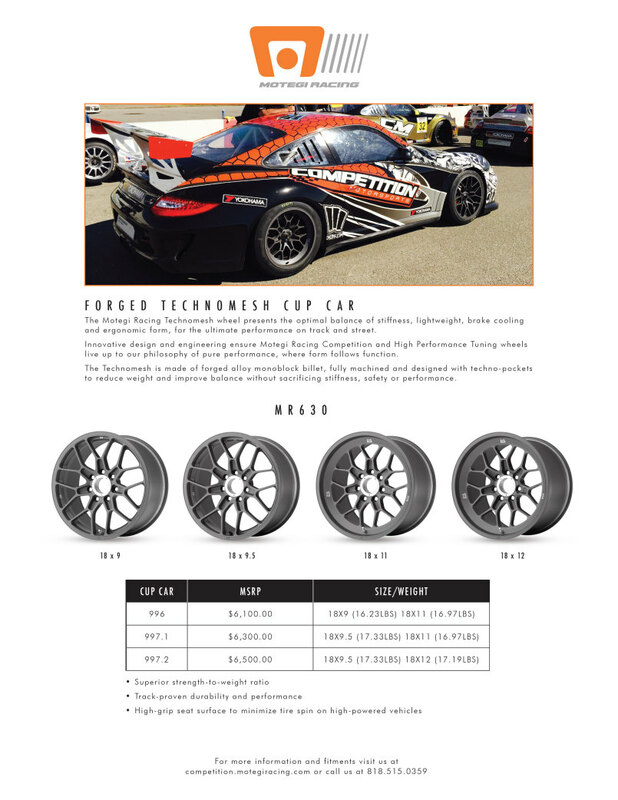 This photo feature stemmed from Motegi Racing’s collaboration with Competition Motorsports in developing the Porsche compatible version of the MR630 Technomesh Motorsport racing wheel (which is compatible with 996, 997.1, and 997.2 GT3 Cup Cars).